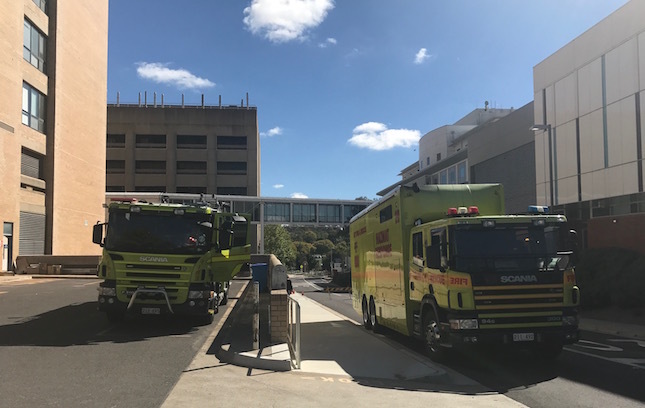 Emergency services at The Canberra Hospital are restricted to major trauma today and outpatient clinics and elective surgery have been postponed following a switchboard fire last night. Self-presenting emergency patients are encouraged to attend Calvary Hospital’s emergency department today. 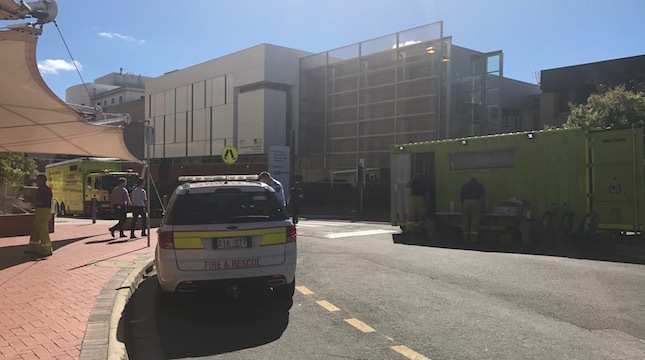 An electrical fire in the switchboard in the Canberra Hospital’s main reception building was extinguished last night but power to a number of main patient and administrative buildings was affected for several hours. Up to 60 people were relocated as a precautionary measure from the staff and public residence building. Power has been returned to the most sections of the main building and the Canberra Hospital Switchboard is operational this morning. When the RiotACT visited at 11am, some corridors remained in darkness. Staff were unable to access some sections of the main building due to security passes not functioning and doors therefore remaining locked. ACT Health, with the assistance of emergency service crews and ActewAGL, worked through the night to manage the incident. The safety of patients and staff remains the number one priority for emergency services staff, an ACT Emergency Services Agency spokesman said. Hospital Road, which runs through the Canberra Hospital campus, remains closed until further notice with traffic management plans in place. However, access to the National Capital Private Hospital will be permitted for staff and National Capital Private Hospital patients today. Details of the impact on hospital services will be updated on the ACT ESA website throughout the day. “We thank the community for their patience as we manage this incident and remind people if possible not to visit the hospital today to see your loved ones,” the ACT ESA spokesman said. “This advice does not apply to the friends and family of critically-ill patients. All outpatient clinics across the campus are cancelled on Thursday 6 April 2017. Outpatient clinics are contacting patients to reschedule these appointments in the coming days. All elective surgeries scheduled for Thursday 6 April 2017 will be postponed. Patients are being phoned by staff from ACT Health advising of this and provide a new booking time. Chemotherapy out patients treatment will not be affected, however radiation therapy and consultation clinics have been postponed, this will be reviewed this at 12pm today. All affected patients will be contacted by the Service to advise of any changes. The Centenary Hospital for Women and Children (Building 11) is not affected by the incident. Women who go into labour and are scheduled to give birth at the Centenary Hospital, should present at Centenary Hospital as per their birth plan. For women booked through the Foetal Medicine Unit for a caesarean, as elective surgery services have been postponed for Thursday 6 April, you will be contacted by the Surgical Booking Unit. The Canberra Hospital Emergency Department remains operational for major trauma. However, community members self presenting for emergency care are strongly encouraged to go to the Calvary Hospital Emergency Department. For life-threatening emergencies and need of an ambulance call Emergency Triple Zero (000). For people with minor illness or injury the community is reminded of the Walk In Centres in Tuggeranong and Belconnen. Walk-In Centres will open at 7am on 6 April 2017. For appointments at Community Health Centres, please contact the Community Health Intake Line on (02) 6207 9977. The Community Health Intake is ACT Health’s central booking line for community based services. The community can seek after hours health services from Health Direct via 1800 022 222 or the National Home Doctor service on 13SICK (13 74 25) for a GP home-visit. I just wanted to note that CALMS (the Canberra After hours Locum Medical Service) is another after hours health service that is fully operational. They provide GP clinic consultations out of the Canberra Hospital, the Calvary Hospital and the Tuggeranong Health Centre, and can be contacted on 1300 422 567.